It’s hard to realize that a year ago we were coming back from our five-month stay in Paris. A year, really, already? Time flies: it’s not just a clichéd expression, it’s a reality. 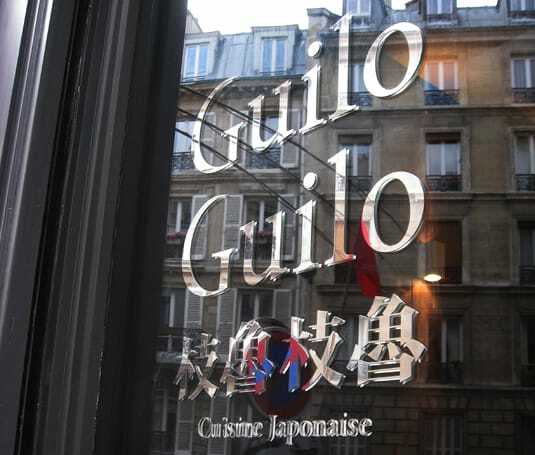 Throughout our stay in Paris, one of our gourmand friends kept on talking about the Guilo Guilo, a Japanese restaurant in Montmartre. Of course, he was praising it, and to hear him describe the meals he had had over there was mouthwatering. It was clear we didn’t have a choice but to go there at least once during our stay. Some time by the end of April, my friend tried to get a reservation. Turns out Guilo Guilo, not only being very popular but also rather small, is pretty hard to book. The only night we could catch the last table (at 9:30 PM, which is best because nobody else is waiting for it, allowing you to take your time enjoying the meal) was the day right before we left. We would have to wait a while but we thought it would be a fantastic way to end our trip. And what an understatement this turned out to be! I have to admit that I’m sold on everything Japanese. 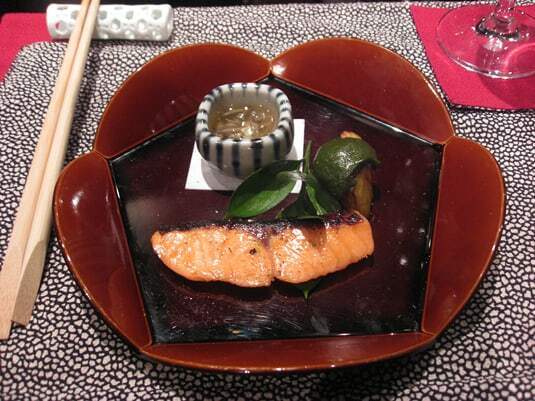 Of all Asian cuisines, Japanese cuisine is by far my favorite for its subtle flavors, numerous (and often mysterious) seasonings and graphic presentations. The Guilo Guilo is all that, and more. 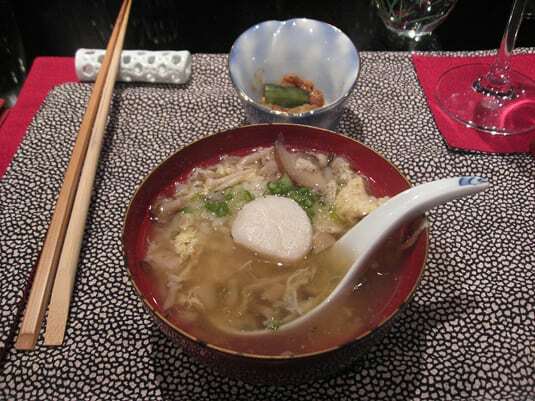 Its chef, Eiishi Edakuni, is very well-know in Japan and, perhaps wanting to spice things up in his restaurateur career, he chose Paris as his adoptive city in 2008. 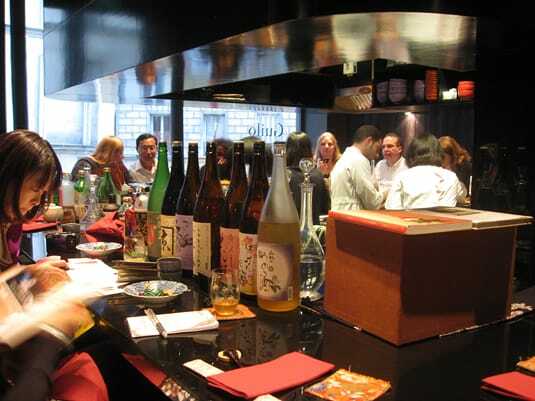 Naming his Parisian restaurant as a pun on the original Japanese name of his Kyoto restaurant (called Giro Giro, the “R” pronounced like an “L” in Japanese), he set out to become a leader of “New Wave Japanese” in the City of Lights. If Edakuni is a star in Japan, he didn’t pack his ego in his suitcase when he moved to Paris. The chef is very Japanese: small, bald, wearing a goatee and greeting guests coming into his restaurant by bowing and saying a shy Bonsoir. 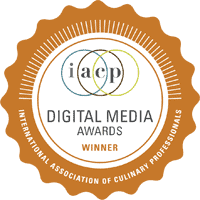 He cooks everything right in the center of the restaurant in a small open kitchen where servers and helpers move around in a coordinated manner without ever stepping on each others’ toes. 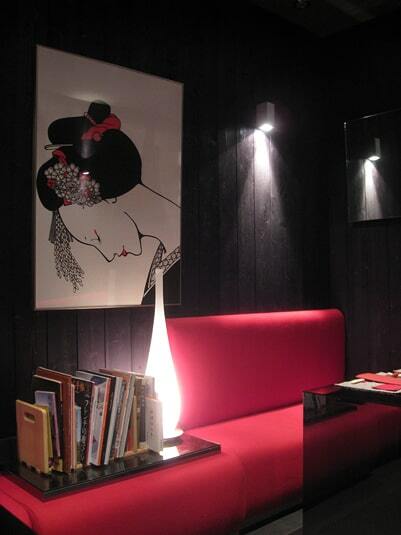 The décor is dramatic, all black, lacquered and matte, red and white. Recognizing my friend, he led us to a private salon at the back of the restaurant, where only two tables for four to six people sit side by side in a tight but very elegant space. Everybody else sits at the bar, all around the “kitchen”, or at one of the very few small tables around it. While sitting at the bar must be fascinating because of the opportunity to watch the chef work his magic, the private salon was perfect to allow E and I and our two good friends to freely express our wonder at each dish, first when it was presented to us (sometimes by Edakuni himself), then when we tasted it. 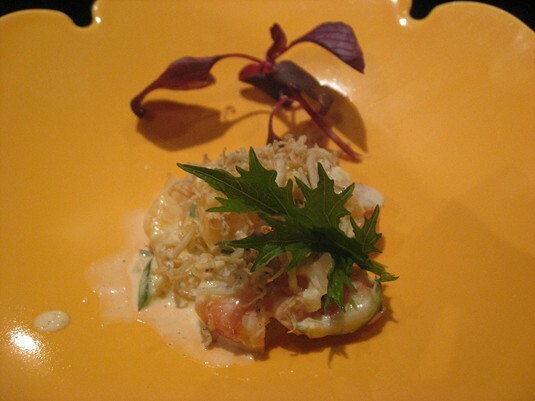 Eiishi Edakuni reinvents his menu every month, so you’re sure never to eat the same thing twice at Guilo Guilo. The six- to eight-course tasting menu was priced at €45 when we were there, which is a steal given the menu’s refinement. Pair it with one of the outstanding cold sakes they keep (they provide very good advice) and you’re in for a heavenly night. 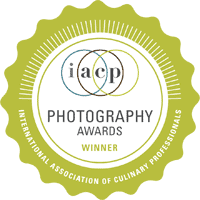 I (of course) took pictures of my plates. 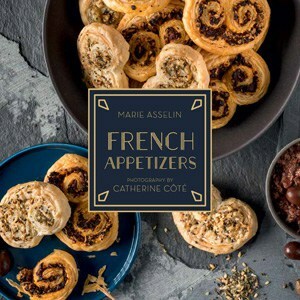 Their quality doesn’t honor the array of tastes I had the pleasure of enjoying that night, but I hope they will pique your curiosity enough to (try to) book a table next time you’re in Paris. Plan to call a month in advance to make sure you make it. Address and phone number are below the pictures. 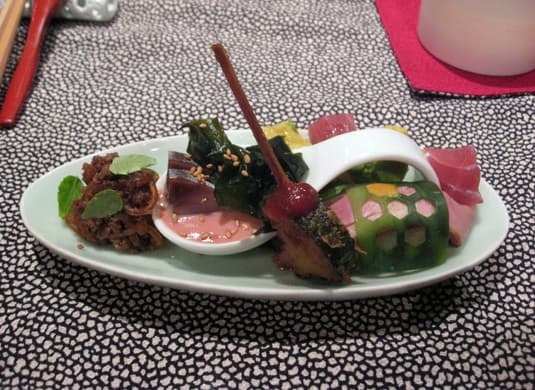 2nd course: To the left, a small bite of beef and thai noodles with miniature basil leaves; in the center spoon, herring; on the skewer, a courgette; to the right, a fillet of duck sushi with a slice of cucumber with hexagon cut-outs (one of which is esthetically filled with wasabi); to the back, tuna sashimi with avocado. 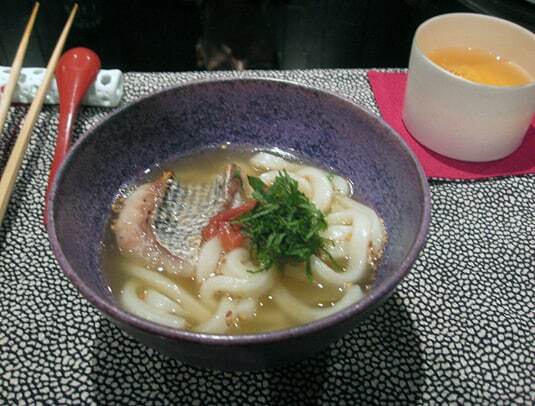 3rd course: Udon broth with grilled sea bream. 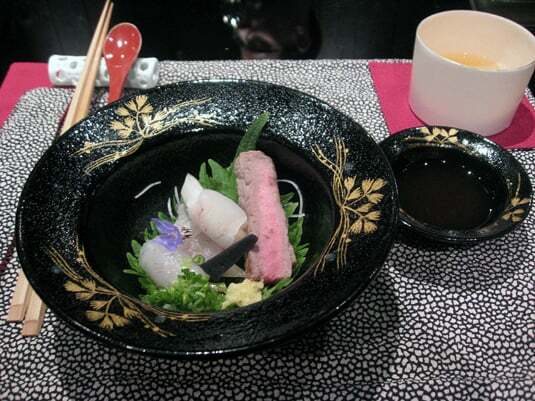 4th course: In the center, turbot sashimi with daikon radish; to the right, incredibly tender Japanese beef with its dipping sauce. 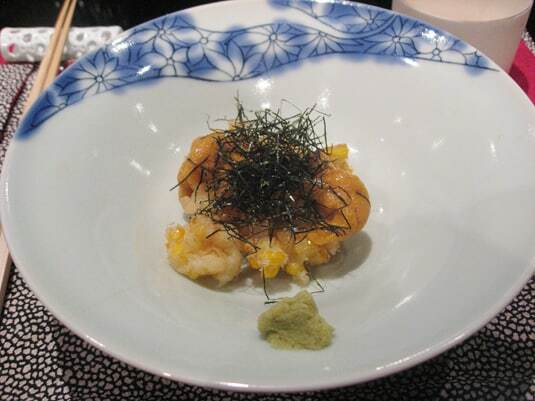 5th course (which the chef called the “main course”): Corn tempura with sea urchin coral. The most complex and surprising course of the evening: the tempura’s crunchy texture and sweet flavor perfectly balanced the salty creaminess of the coral. 6th course: Glazed trout, eggplant caviar with a cream of spinach and a cold shooter with small seaweed shoots that looked like mini-mushrooms (surprisingly delicious!). 7th course: A more traditional but very tasty soup with rice, egg and a scallop. Served with a small cup of pickled vegetables. 8th course: (This could’ve been our dessert) Foie gras sushis. Oh yes. 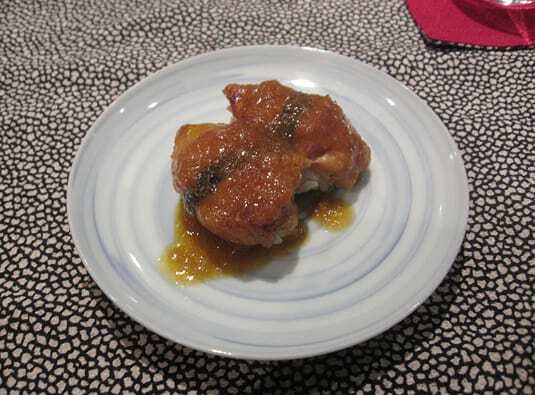 They were warmed up by the sauce that softened the foie gras underneath. To die for. 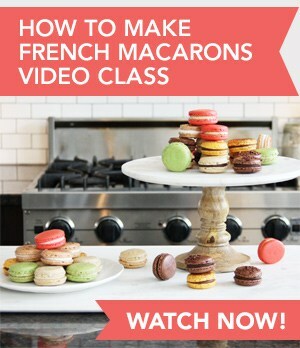 I hear this is the only dish the chef makes again and again because it’s so popular. 9th course: Dessert plate. 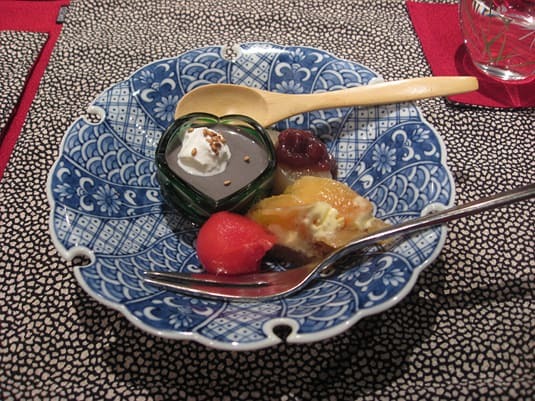 In the green cup, a black sesame panna cotta (which explains the mysterious gray color); in front, a watermelon ball marinated in Japanese plum wine; to the right, vanilla and dried peach ice cream; on top, a piece of pear with adzuki (red bean purée). I have been hunting for reliable suggestions on travel tips and think that your site is a good source of information. It is hard to locate reliable recommendations on the Web, but I think I can put this to use! 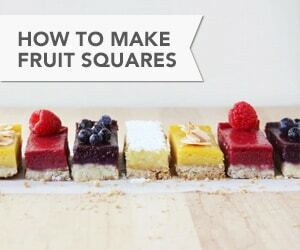 If you have any more savvy ideas, please don't hesistate to publish them. Thanks a million! Long time viewer / 1st time poster. 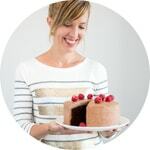 Really enjoying reading the blog, keep up the excellent work. Will most definitely start posting more in the near future.